THE MINISTERIAL PRESS BRIEFING SPEECH DELIVERED BY HON. ADEBIMPE AKINSOLA, SPECIAL ADVISER AND ACTING COMMISSIONER FOR TOURISM, ARTS AND CULTURE IN COMMEMORATION OF THE SECOND YEAR ANNIVERSARY OF THE ADMINISTRATION OF HIS EXCELLENCY, MR AKINWUNMI AMBODE, THE GOVERNOR OF LAGOS STATE ON MONDAY 24TH OF APRIL, 2017 AT THE BAGAUDA KALTHO PRESS CENTER, ALAUSA, IKEJA. The Ministry of Tourism, Arts and Culture in keeping to its vision of making Lagos State One of the Top Ten Preferred Destination for Tourism and Entertainment in Africa has continued to engage in programs and events set at achieving the vision in the last two years. It therefore gives me great pleasure to be here to render an account of our stewardship and achievements in commemoration of the Second year in office of His Excellency, Mr. Akinwunmi Ambode, the Governor of Lagos State. Tourism and Culture were departments under different Ministries untill 2015 when the present Administration realligned the State ministerial structure and responsibilities in line with the desire of His Excellency, Mr Akinwunmi Ambode, the Governor of Lagos State to strategically harness the economic benefits provided by the abundance of talents in creative arts, entertainment and sports in the State. The formulation of Project THESE (Tourism Hospitality Entertainment and Sports) to achieve excellence was thus conceived to generate economic returns to the State. In terms of organisational efficiency, the dream for achieving the desired goal can only be met with the accommodation of arts, culture and tourism responsibilities under same ministry. Hence, the creation of a full-fledged Ministry of Tourism, Arts and Culture confirms the importance the Administration attaches to the sector and demonstrate readiness to tap into the huge benefits and socio-economic potentials in the creative industry. Initiate, formulate, execute, monitor and evaluate policies relating to Tourism, Arts and Culture. Relations with and regulation of tour operators and travel agents within the State. Registration, classification and regulation of places of entertainment and recreation such as night clubs, pool betting and gaming machines. Management of tourism assets, such as beaches. Organization of all State Tourism activities in conjunction with other relevant Agencies. Establishment of a mini-exhibition Centre for the purpose of projecting the image of the State. Establishment and Management of project THESE – (Tourism, Hospitality, Entertainment, Arts and Sports for Excellence). Any other duty as may be assigned by the Governor. To use entertainment as a tool to increase consumption of Lagos Tourism products. Ensure that tourists consume more of Lagos State to strengthen tourism establishments and institutions and also to create employment opportunities in the sector. To cause an increase in economic activities with a direct bearing on hospitality, entertainment and job creation. To cause an increase in internally generated revenue of the State through increased tourism related activities. To encourage internal tourism among the residents of Lagos State. Arouse the interest of the rest of Nigeria and the Continent to visit and consume all that Lagos has to offer. To partner with the private sector in defining and strengthening the component units within the tourism sector. To create more tourist destinations and restore historical heritage sites around the state. As set out in the objectives, the Ministry through the combined efforts and contribution of its departments, units and agencies under its supervision, was able to accomplish the following within 2 years of the Administration of His Excellency Mr Akinwunmi Ambode, the Governor of Lagos State. The Ministry recognized the importance of strategic branding of destinations to the development of tourism and is exploiting the identified benefits of destination branding. By registering the “One Lagos” “Love Lagos” and the “One Lagos Fiesta” brands at the trademarks registry. The “one Lagos” brand which is the master brand for Lagos is packaged to showcase the true spirit of Lagos through different creative expressions while leveraging on the City’s abundant soft” power to reverse the negative conversation often associated with Lagos; reinvigorate tourism across the state by celebrating our unique people, places and heritage and positively promote Lagos as the Destination in Africa. The “One Lagos” brand was launched formally in July 2016. The launch will ensure the promotion and development of the Culture of Entertainment, Arts and Leisure in the State. In line with the Ministry of Tourism, Arts and culture’s vision of making Lagos State one of the preferred Tourist Destination in Africa, the Lagos State Government in conjunction with WhiteStar held the maiden edition of The Lagos Street Party on the 3rd and 4th of December 2016 at Ahmadu Bello Way, Victoria Island, Lagos. The two-day street Party featured live musical performances, comedy, dance sessions and diverse cuisine and creative indigenous games were showcased for the audience. The event also focused on fostering commerce by providing young entrepreneurs the opportunity to sell their goods at the event. 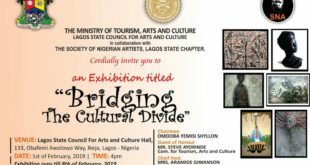 A major component of the event was the exhibition of various artworks and artefacts produced by young talented artists drawn from various secondary schools and tertiary institutions in Lagos State. In its bid to use entertainment to promote tourism and to ensure that all parts of the State feel the impact of the New Year Countdown, the present administration conceptualize hosting the event in the five divisions of the State. The State redeveloped the countdown model and use the platform to turn the entire state into one community; celebrating change and the achievements of the past year with a strong expression of hope for the New Year. The entire citizenry of our dear State exhibited unlimited pride for being the entertainment hub of sub-Saharan Africa with an eight-day show laced with flamboyant multi-cultural expressions across the five divisions of the State. The customized stages inscribed with location names – Agege, Ikorodu, Epe, Lagos and Badagry, resonate with beautiful lighting designs and sounds of joy and happiness. Lagosians were treated to an all-inclusive series of events including music, food, drinks, comedy, dance and theatre, and Talent Hunt competition to discover and develop young and talented artist for spanning from the 24th to 31st of December 2016, till the early hours of 1st January, 2017. Over (50) renowned major artistes and hundreds of aspiring artist performed for over (500) hours in a “one community, one celebration and one purpose” approach. The expanded venue format, infusion of cultural elements of the communities and creation of socio-economic opportunities beyond the Lagos metropolis, threw up unprecedented economic gains as artisans were engaged, food and snacks vendors and consumer brands thrived in areas earlier considered unprofitable. The fiesta was planned, managed and executed by team of professionals in the Ministry of Tourism Arts and Culture and supporting MDA’s within the State’s Civil service structure. I seize this opportunity to thank our sponsors most especially the Nigerian Breweries Plc, Globacom, Pepsi, Mikano and DSTV for their support and partnership in making the Y2016 One Lagos Fiesta a success story. In February 2016, His Excellency the Governor of Lagos State inaugurated a Committee of 12 members headed by Professor Wole Soyinka and Late Chief Rasheed Gbadamosi. The Committee began the Countdown to the 50th Anniversary of the creation of the State on 27th May 2016 and series of colloquia and divisional activities were held to celebrate the rich history and culture of the state. The celebration of the last 50 days countdown to 27th May 2017 however commenced on the 8th of April 2017 with the Musical Stage Play WAKAA. The celebration emphasizes the need to showcase and harness the creative talents in arts, craft, culture and entertainment industry to promote economic growth and development. This is in line with the main focus of the golden jubilee anniversary, which is to take stock of the outstanding developments achieved by the state in all spheres in the past five decades and to use this as the basis to chart the parts for future economic and all round development of the state recognizing the diversity of its citizenry and preserving its history and heritage. 9. 18Th May, 2017 Special Judiciary Session Lagos High Court, Igbosere. Monuments have been created for thousands of years and they are often the most durable and famous symbols of ancient civilization. Monuments are also structures that are explicitly created to commemorate a person or event or which has become important to a social group as a part of their remembrance of historic times or cultural heritage. A good monument must be visible and appreciated not only by the indigenous people but also by tourist and visitors. The historic Tinubu Square fountain was renovated and opened for public use on the 27th of January 2017. The reopening of the fountain located on Broad Street in the heart of Lagos Central Business District in honor of Madam Tinubu has provided a world class recreation facility befitting the foremost business precinct in Nigeria. The statue of King Ado, the first crowned king of Lagos, was unveiled at Moloney street, behind Tafawa Balewa Square, Lagos on the 6th of February, 2017. Prince Ado is reputed to have named Lagos Island, Eko. He reigned between 1630 to 1669. King Ado was the son of Prince Ashipa, A warrior that came to Lagos from Benin. On arrival in Lagos, Ashipa met Prince Olofin and his people, and there was a long period of war between the two of them until death of Olofin. Ado the son of Ashipa later became the First King of Lagos. He was succeeded by his son Gabaro, who was succeeded by Akinsemoyin and the ascension to the throne of Oba of Lagos has remained in his linage ever since. The legendary Prince Olofin Atekoye, referred to as the first migrant from Ile- Ife the cradle of the Yorubas to settle in Lagos. He was the grandson of Oduduwa a powerful hunter, warrior and a renowned blacksmith. The shrine of Olofin Atekoye still exists at Iddo where he first settled. The Children of Prince Olofin are today known as IDEJO’S who are the popular white cap chiefs of Lagos. The statue was also unveiled on the 6th of February, 2017 at Ijora, Olopa, Ido, Lagos. The two monument sites will serve as destinations for tourists in need of historical information about Lagos heritage and enrich their knowledge of the Arts and Culture of the people of Lagos State. This abstract monument projects the motherhood affection that exist between a mother and her child. As depicted in the title, this sculpture focuses on the cry of the child, demanding for the loving attention of the mother. This love and attention is deliberately expressed in the flow of forms as structure of the child flows into the mother figure, while the mother is seen holding firmly unto her child. In the midst of all this love and tenderness displayed by the mother, the sculpture also projects pride, firmness, authority of the mother guiding, protecting and caring for her child. In our society, mothers are known to have very passionate affection for their children, while children are strongly attached to their mothers. This monument is an expression of the profound importance our society attaches to motherhood and care of our children. Meaning the beauty of an African woman. An iconic monument of a Lagos woman and her contribution to the economic development of Lagos State. This monument is in honour of the much talked about Lagos Women (Sisi Eko). It celebrates and conveys the sense of beauty, grace, style and passion for fashion of a Lagos woman. The curve forms projects the femininity of the sculpture, the provocative posture and angles expresses elegance, sophistication and stylishness. Gentlemen of the Press, in line with our urban renewal focus and the desire to provide only the best for Lagos State, the Ministry has embarked on reconstruction of some monuments for better appreciation of the intended reason for which they were erected. The monument will replace the existing statue of Chief Moshood Kashimawo Olawale Abiola at the popular Abiola Garden located towards Alapere along the Lagos Ibadan expressway. The location provides a wider garden for tourists, visitors and Lagosians for picnic and relaxation. The New Statue is of international standard and an imposing world class sculpture. Late Chief MKO Abiola as we all know was a Nigerian philanthropist, businessman and politician. The monument celebrates the icon of the annulled June 12, 1993 Presidential election in Nigeria.